They didn’t manage to get a new statue of war hero Max Manus in place in time for Liberation and Veterans’ Day ceremonies on May 8, but city and state authorities could finally unveil Oslo’s newest memorial this week after months of debate. They chose June 7th, which not only is the day when Norway broke out of its union with Sweden in 1905 but also the day when the late King Haakon VII returned to Norway after five years of exile in London during World War II. That seemed an appropriate day to honor Max Manus, a legendary leader of the resistance forces who officially kept serving for King Haakon throughout the German occupation. Manus was best known for his sabotage operations in Oslo that were a constant source of frustration to the occupying forces. His most dramatic sabotage involved blowing up German vessels and those taken over by German forces in the Oslo harbor. 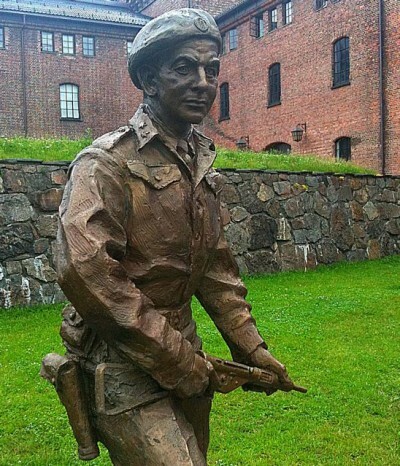 That’s why the new statue of Max Manus by sculptor Per Ung finally found its place at the Akershus Fortress, overlooking the harbor area where Manus was so active in the early 1940s. Original plans were to place the statue at the Aker Brygge waterfront complex, on the site of the old Aker Shipyard, but that was an area where another resistance group, Pelle-gruppen, was most active and many felt the Aker Brygge location was not historically accurate for honoring Manus. All sides in the debate finally settled on the Akershus site for Max Manus and Aker Brygge for an eventual memorial to the Pelle group. The site at Akershus also overlooks the pier from which the infamous German vessel Donau once sailed, carrying German troops to Norway, and Jewish families from Norway to the concentration camps of the Nazi regime. Manus played a key role in blowing up the Donau in 1945, just months before the Germans surrendered. 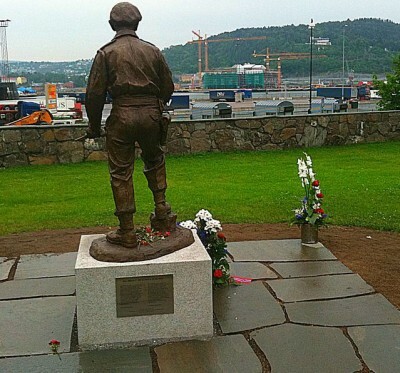 His statue was unveiled on Tuesday by another resistance hero from World War II, 93-year-old Gunnar “Kjakan” Sønsteby. Both he and Manus operated in the so-called “Oslo Gang” and a statue of Sønsteby already has stood at Solli Plass in Oslo for several years, right next to one of Winston Churchill.